To add blog shortcode to your page simply click on blog shortcode button, that can be found integrated in default editor panel in visual mode. See image below. Please note, that blog shortcode and page have different design. “Category of blog” – you need to choose your blog category here. Post from this category will be displayed. If oyu don’t have any posts and categories yet, then you need to create them first, before adding blog shortcode. “Show per page” – you can define how many post to show per page. 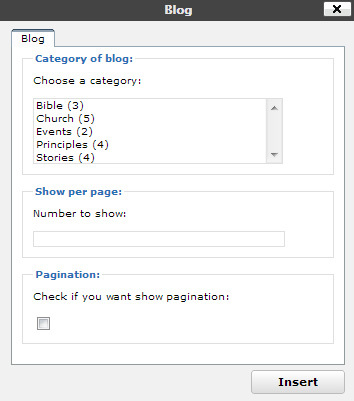 “Pagination” – You can choose whether to show pagination or not. If you turn off pagination, then only set amount of posts in “show per page” field will be displayed.